Availability: Usually ships in 2-4 weeks. This lighted natural tin star Christmas tree with colored glass marbles will make your holiday display sparkle. Each star branch, with its hand punched designs and colored marbles, creates a dazzling effect for any Christmas display. These unique metal Christmas trees are hand made from natural tin and wired with two light sockets inside. The handcrafted frosted glass star tree top has a hinged access door so you can illuminate it with a tea light candle. These shiny tin star Christmas trees will create a beautiful ambiance in any southwest, traditional Mexican or rustic Christmas decor. Easy to assemble: Shipped in three pieces. To assemble, screw in bulbs (not included), set upper section of tree on to lower section and attach with two slide pins. Place glass star on top and secure with screw. Since each lighted star tree is hand made, size and detail may vary. 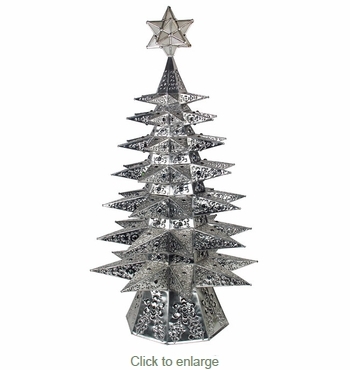 Our tin trees are all handcrafted in Mexico. • 8 star points on each level. 7 levels. 56 total star points. • Looks great from every angle. • Star tree points have round button ends. No sharp points. • Use colored light bulbs for added affect. • Inset glass marbles on star points and between levels.